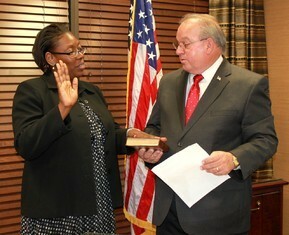 Assistant District Attorney LaKetha W. Holmes was recently sworn in by District Attorney John DeRosier. Holmes is now managing the Juvenile Section of the Calcasieu Parish District Attorney's Office. LaKetha Holmes is a native Californian where she hails from Monterey Bay. Holmes received a B.A. in Political Science from the University of the Pacific, located in Stockton, California. Thereafter, she obtained a J.D. from Southern University Law Center in 2009. Holmes's past work experience includes being a Staff Attorney for the 36th Judicial District Court (Beauregard Parish). She was also a Children's Attorney with Mental Health Advocacy Services and an A.D.A. for Beauregard Parish. Holmes is an active member of the Star of Bethlehem Baptist Church in DeRidder, a mother of two and is married to felony prosecutor, Bobby Holmes.